Northlanders #1-8 "Sven the Returned"
Brett Favre would not be able to give these Vikings the run around. The Vikings of Northlanders live and die by the sword. They inhabit the northern lands of Europe, northern Scotland in "Sven the Returned," and are tough like their environment. There is honor in their actions, which Favre can learn from, but there is also a brutal fierceness which also comes across in these Northlanders tales. The first adventure, "Sven the Returned," spans the first 8 issues. Sven, is the heir to a community which has lost their leader to death. The son returns looking for a quick monetary fix, but receives an unwanted welcome by his cowardly and now ruling uncle. Sven begins a serious of Guerrilla warfare against his uncle and his uncle's followers which slowly drains the community of combat ready males. When the battle comes to a head an unexpected outside threat rears it's non-horned helmet giving the vikings a shock to their bearded community. Northlanders is a brutal title. Carried under DC's Vertigo publishing, Northlanders is given the ability to tell the story through bloody visuals and sexually charged intimate moments. The story writer Brian Wood and artist Davide Gianfelice want to tell is left unfiltered and in turn enjoyable. Though I wouldn't say the story is anything new because it is basically the "Lion King" with humans, it is still worth checking out. Gianfelice's art is strong and gives the vikings look that breathes warmth in a horribly cold setting. The arcs in Northlanders cover different characters in different time periods in different regions in...just kidding, that's the end of that thought. The best way to read Northlanders is in the collect forms. It keeps everything separate, so that you aren't even reminded that there are other stories beyond the arch you are on. 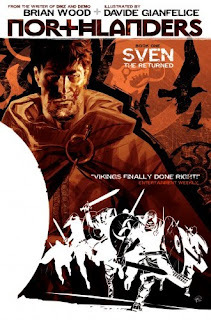 No annoying preview page for the next issue enticing you to continue on...not that it would be a bad thing to check out stories beyond this comic of the day, Northlanders #1-8, "Sven the Returned."